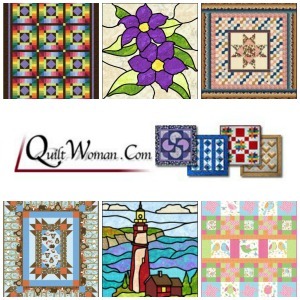 QuiltWoman.com is a true tastemaker in quilt design. There is a reason that QuiltWoman is one of the most trusted names in quilting, and this pattern bundle explains it. Each collection includes a wide variety of styles, techniques, and skills that will keep any quilter busy. From placemats and table runners to full bed-size quilts, there is something for everybody. Every pattern is carefully laid out so as to be easy and intuitive to follow, with helpful tips and tricks included along the way. In addition, a complete materials checklist can be found on the back of the pattern, so you can be sure that you have everything you need before you start. Some of the patterns also include multiple color schemes, added flair or embroidery, and even a choice between several different design schemes based around the same theme. In other words, they're patterns that you can use again and again without ever having the same result. As an added bonus, each bundle also includes two patterns from the Paned Expressions Studios collection. Styled to look like stained glass, these are among the most beautiful quilt designs you'll find anywhere. The Paned Expressions Studios quilts make use of bright, bold colors contrasted against soft, textured background fabrics to create a quilt that will have visitors stopping to stare. A quilt pattern should never be used just once, and these bundles from QuiltWoman.com are guaranteed to remain at the top of your go-to pile for unique, beautiful quilt designs. What a lovely bundle for giveaway! Love it..
Is the entry page somewhere, & I just don't see it? Today's the 18th, I think. You can also find a link to this and all our contests in the "Giveaways" page, up in the header!